Second, the Plaza Accord had widely different effects on the monetary policies of the 5 participants: France, Germany, Japan, the US, and the UK. Compare the US and Japan, for example. For Japan there was a clear effect on its monetary policy strategy. 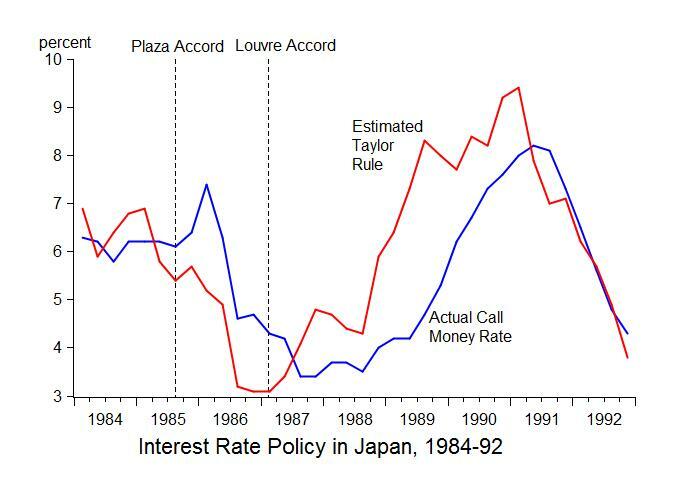 The following chart, which comes directly from a chart published by the IMF, shows the actual policy interest rate in Japan (the call money rate) for the years 1984 to 1992 along with the policy rate recommended by the Taylor rule as calculated by the IMF. The chart shows how the interest rate was too high relative to the rules-based policy in late 1985 and throughout 1986. It also shows the swing with the policy rate set well below the rule from 1987 through 1990. The evidence of an effect of the Plaza Accord on Japanese monetary policy goes beyond this simple correlation. The Plaza and Louvre communiques included specific commitments about Japanese monetary policy actions. In the Plaza Accord Statement, the Government of Japan committed to “flexible management of monetary policy with due attention to the yen rate.” In the Louvre Accord Statement, “The Bank of Japan announced that it will reduce its discount rate by one half percent on February 23.” Thus, the policy deviations were clearly due to the way that Japan implemented the Plaza Accord and later the Louvre Accord. In contrast, for the US, the Fed’s monetary policy strategy was not affected at all, as Chairman Paul Volcker readily admits. The communique simply confirmed that the overall strategy that the Fed was pursuing would continue. As will I explain in a paper prepared for the 30th anniversary conference next week, these two lessons have important implications for the future. What is past is prologue. Study the past.